Staying in touch with residents local to our client’s infrastructure maintenance works is vital to the success of United Utilities projects. The company prides itself in ensuring local residents are made aware of the works which are being undertaken and the potential areas for disruption to their day to day lives. And our client communicates their updates always with customer satisfaction in mind. 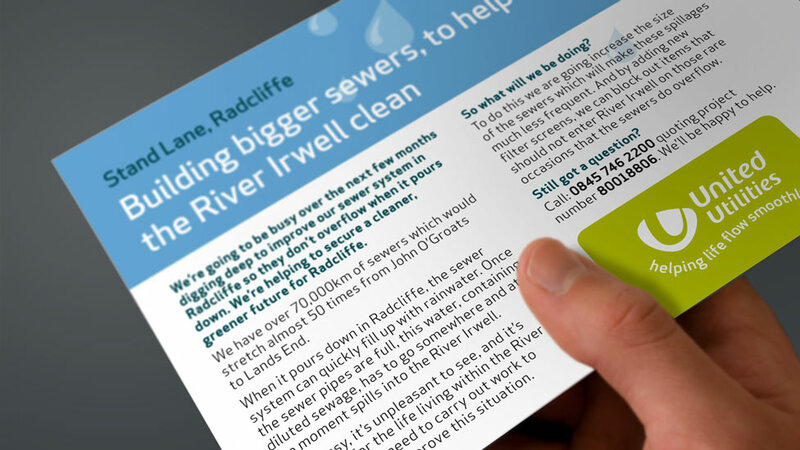 To transmit this message, United Utilities commissioned our creative team to produce an engaging and informative leaflet design they could distribute to residents in the affected area. A band of colour at the top of the leaflet design prominently highlights what improvement works are planned by our client, and the location affected. The message is clear straight away. The leaflet design also includes illustrated maps and diagrams showing changes to traffic routes, and detail on times and area where the work would be taking place.